If the sunlight illuminates a flower in the woods but no one is around to see it, is it still beautiful? Beauty is in the eye of the beholder, but if no eye beholds it, is it still beauty? 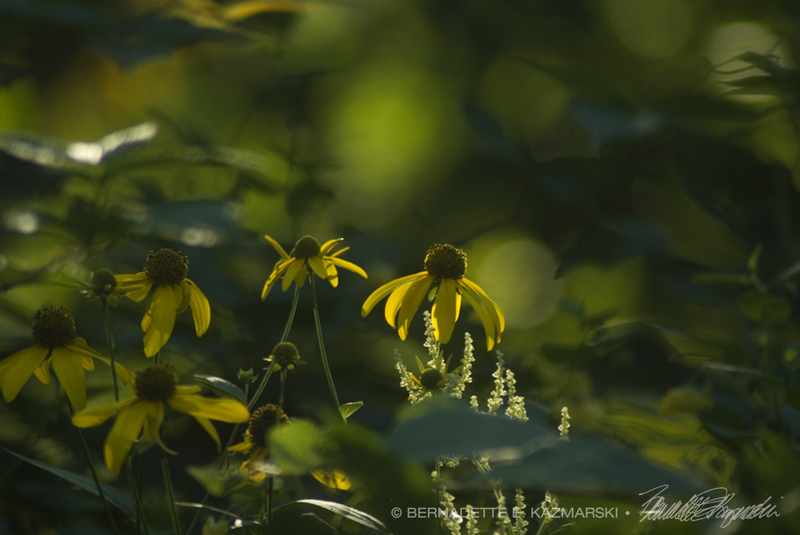 I photographed this scene for the obliquely backlit combination of bold yellow coneflower and delicate wormwood with all the varied patterns and shades of green in the background, silhouettes, shadows, blurs and bokeh, and titled the photo “Backlit Bouquet”. But the image had more to say. I walked along the trail as the sun set and could see as it moved that features were randomly highlighted—a cluster of leaves, a flower, the bark on a tree, and in watching the process it almost seemed intentional, as if some force or the sun itself wanted me to notice these things. As each thing was featured it did appear beautiful to me, but the one coneflower in the group that was highlighted gave me a new perspective. I would not have noticed them otherwise, and the one that was highlighted indeed seemed more beautiful than the rest because of the highlight of its graceful fall of petals, bold yellow color and soft rounded center, and all else seemed to be a backdrop to its special prominence. When I shared the photo I scribbled the first draft of a new poem. I knew it wasn’t quite right. “We’ll see what it develops into some time in the future,” I said then. A few weeks later the poem was still with me. Once I’d written the rest, I found I just didn’t need those two first lines, they felt heavy and formal, and without them I found I could reorganize the lines of the poem, especially that really long one that I couldn’t split before. I also changed the word “journeyed” to “reached” because it was more of what I’d intended, remembering the sunlight that day as it moved down toward the horizon and reached and touched different spots deep in the woods. Added a comma too, and it became the finished poem above. Read more poetry on my Poetry page.